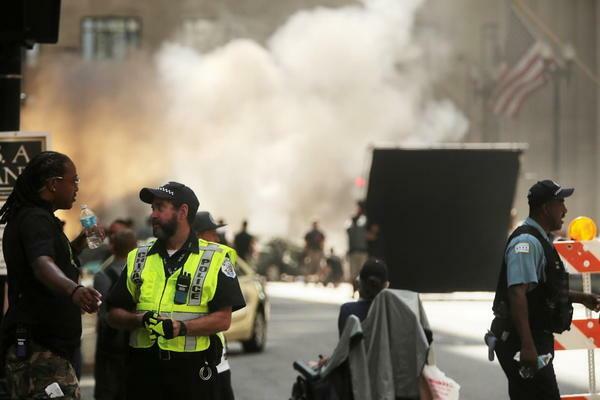 Last weekend, Transformers: Age of Extinction filmed in the LaSalle Street area for two days. Exactly what was filmed remains mostly unknown as it was closed off to the public much more effectively than normal. It seems part of that was because the usual Bayhem was in play as a description from the Chicago Tribune indicates lots of pyrotechnics and exploding vehicles was filmed. Thanks to Colin H. for the link. Most spectators, however, had to settle for listening to much of the action rather than watching it due to the barricades set up to keep people blocks away. Explosions could be heard echoing through LaSalle, but it's unclear what exactly was exploding. One production assistant claimed a Bud Light delivery truck was blown up during one scene, sending beer flying out onto the streets, but the Chicago Film Office was unable to confirm it. Those more interested in the cars than the explosions had better luck. Several vehicles — including the semi known as Optimus Prime, a blue Bugatti and green Corvette — raced down LaSalle at high speeds for one scene Saturday. 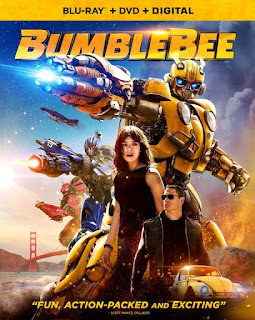 During another scene that day, the yellow Camaro known as Bumblebee sped off as terrified extras ran for their lives. The extras continued to get a workout during Sunday's filming, which featured pyrotechnics. Chicago was well represented on the set Saturday: Abandoned Chicago taxis and Chicago police cars were on hand, as was a CTA bus featuring a very visible Blue Cross Blue Shield ad (Transformers filmed at the Blue Cross Blue Shield Tower in the Near East Side neighborhood the previous two weekends). Also on the set was a crushed vehicle that was trapped under a robotic-looking hunk of metal. If you search flickr for transformers 4 and sort by most recent.. you get a few pics. Here's one of the Budlight truck explosion. I saw the truck scene, on the cross street down from the Cadillac Theater. It was a major stunt, and I heard it was a one-time stunt. They had the Porsche camera-car and the camera-copter covering it. Basically, the truck crosses the intersection, and boom! the rear of the truck explodes, scattering beer cans, and sending the truck swiveling around 180 degrees, as if something had struck it. I got some video, but it's largely hindered by some vehicles. You can see some extra running as well. Found a Kre-O Picture that might reveal the basic robot designs for five characters. Could be the Lambo down to the right. But it's more of a White colour, so maybe it's the White Camaro. Two Decepticons, one looks to be some kind of Samura/Ninja. Probably from China. The character down to the left has the colours of the Freightliner. Also, Optimus seems to have a more G1 design, though it's hard to tell since it's just a Kre-O figure. "65 million years in the making"
That do kind of tell thet the Dinibots are in it. Those aren't new toys. They are Kreo but not from the movie. Just announcing that they will have Kreo for the new movie. 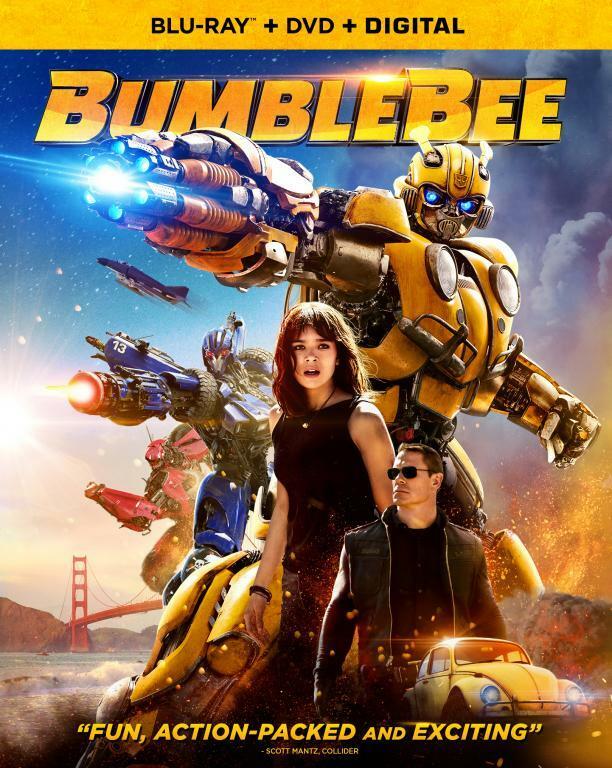 bottom right looks like Grimlock to me.. but it has wheels??? interesting. Maybe you meant the bottom left. But neither of them look like Grimlock. Wait how is it that no one here is excited about the possibility that Bludgeon is in this now? Lol.. Probably bc he is not a part of the G1 cartoon? Most of us are only familiar with cartoon characters. Btw, toys, especially Kre-o, are not a leadingline for the movie, they always have some characters that are not in the movie. But that Bludgeon looking lego, indeed looks like him, he has the skull head/face. I for one, don't read comics, so Bludgeon means nothing to me. I rather watch cartoons/movies. I understand... My fanboyism leads me to follow all the tf media. G1 was great but some of the best tf stories to date come the comics.